This granular formula, utilizing 'binary’ technology to enhance the ability of aquatic plants to tale up available nutrients. This fast and prolonged uptake will reduce the amount of fertilizer needed to get your plant off to a rapid start. In addition to increased plant vigor, this premium formulation will produce the most vibrantly covered water lilies and lotus blooms. 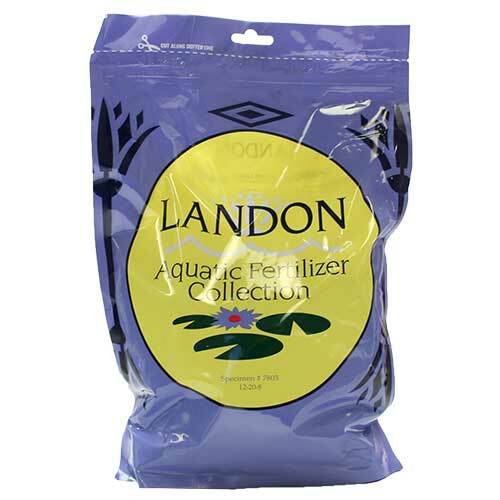 Granulated, LANDON #7803 is designed for use when dividing or repotting lilies and lotus. Combine ½ cup LANDON #7803 with each gallon of soil. Fill pot 2/3 full of this mixture and insert tuber. Cover with plain soil to fill pot. This is all of the fertilizer needed for 60 days. After this date, begin using your favorite 10-14-8 tablet according to the manufacturer’s instructions.